INTEGRATED VACATION – HIGH ACTIVITY LEVEL! This vacation is in conjunction with a “general public” tour group. This trip is best suited for Travelers who are active and high functioning and who have strong social skills, are independent with self-cares, display positive behaviors and want to stay busy. This trips requires lengthy walks/hikes on uneven ground and up/down steps. Not suggested for Travelers with mobility challenges. Limited departure locations (see above). NEW TRIP – GO PLACES AND LEARN STUFF TRAVEL SERIES. Lead by Jill Hunger, an experienced geology teacher and American history buff, this motor coach journey includes some of Minnesota’s amazing natural sites and attractions. 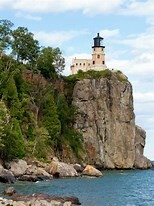 Our stops include: The National Owl Center (Houston); Lark Toys (Kellogg); National Eagle Center (Wabasha); Duluth Harbor Cruise (Duluth); Gooseberry Falls State Park (Two Harbors); Split Rock Park Lighthouse (Two Harbors); Grand Portage National Monument Heritage Center (Grand Portage); the indescribable Naniboujou Lodge for lunch (Grand Marais); North American Bear Center (Ely); Dorothy Molter Museum (Ely) and the International Wolf Center (Ely). At each stop we’ll be engaged with local experts and with Jill, our experienced guide, so that we can fully learn along the way. Amazing scenery, particularly along the north shore of Lake Superior, and time exploring the beautiful waterfront town of Grand Marais is included. Eleven meals and deluxe motor coach transportation is also included. Optional cancellation insurance is available for $141/person ($217 for single) and must be paid with the deposit. Motor coach transportation. Significant walking.